Do You Suffer from Pregorexia? After my first two pregnancies, I was bound and determined to gain fewer pounds when I finally managed to conceive a third time. I read all the literature I could on the impact of weight loss during pregnancy as I was overweight when I tested positive. I soon realized that I was obsessed with everything I consumed. I constantly read labels over and over again, but events beyond my control changed my view of my pregnancy. The doctor realized from a blood test that I was having twins and pregnancy complications started stopped me from controlling my food intake to the point of obsession. However, not all women find out they are pregnant with twins and some even suffer from a condition called pregorexia. Pregorexia is a condition similar to anorexia that occurs during pregnancy. Women are afraid to gain weight during pregnancy so they don’t eat properly. Poor nutrition during pregnancy can cause slower fetal growth, poor fetal development, pregnancy complications and fetal complications. The symptoms of pregorexia are the same as the symptoms of anorexia. The pregnant woman will more than likely move food around her plate or refuse to eat all together. She may claim morning sickness throughout the pregnancy and gain very little weight. Often, black circles around the eyes, poor ski tone and extreme fatigue are also symptoms of pregorexia. Pregnancy is the one time in life when you have to literally think about the life of another human being in addition to your own. The life growing inside of you needs nutrition and it will take that nutrition from your body by any means necessary. 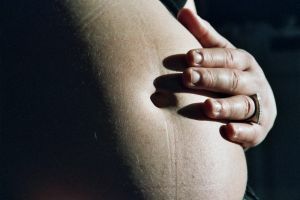 Refusing to eat during pregnancy to prevent pregnancy weight gain is not a safe choice, even for overweight or obese pregnant women.